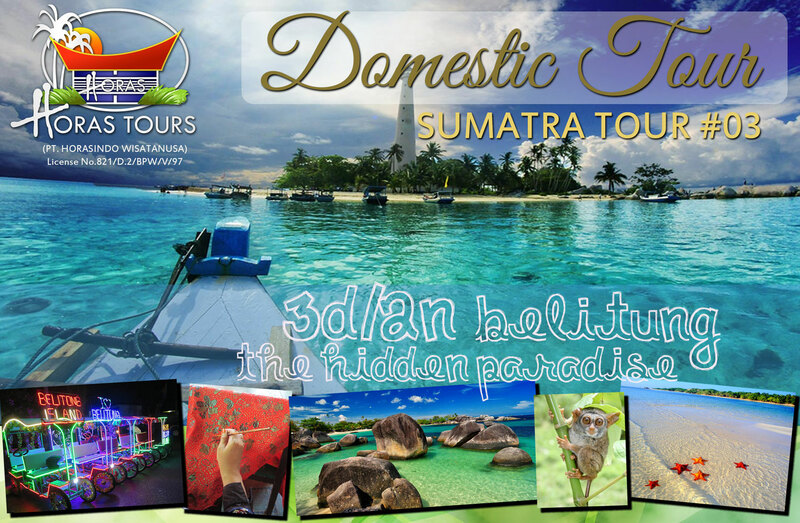 3D/2N Belitung – The Hidden Paradise Blackout Dates: 03 – 17 July 2016 (Idul Fitri Holiday) | 20 Dec 2016 – 02 Jan 2017 (Christmas & New Year) A paradise hidden for so long from the eyes of the world, Belitung is truly a beautiful haven waiting to be explored! This island gained its popularity from an Indonesian box office movie titled “Laskar Pelangi” and since then has been growing to be a popular holiday destination in Indonesia. Experience the luxurious world-class beaches of Tanjung Tinggi, Tanjung Kelayang, Pulau Gusong, Pulau Batu Berlayar, Pulau Kelayang; the panoramic view of Kaolin Lake, the fascinating Belitung culture and the famous film spot of Laskar Pelangi. Just the compact and perfect holiday for you! Please be advised to always bring sunscreen and wear comfortable apparel that protects you from sun exposure, as many destinations have no canopy. Day 01: Belitung Sightseeing Kaolin Lake – Tanjung Pandan Museum Welcome to Belitung! Upon arrival at airport, our guide will welcome and bring you straight to visit the stunning all-white sandstone and torquise water of Kaolin lake. Take time to capture the distinct panoramic beauty, which is one of the sought-after spots for photography lovers. We’ll start with a culinary pit stop to feast the scrumptious Belitung noodle, followed by a visit to the traditional Belitung house and the historical collection in Tanjung Pandan Museum. Dinner will be served at local restaurant and you will be escorted to the hotel. Day 02 : Island Hopping Tanjung Kelayang Beach – Pulau Gusong/ Pasir – Pulau Batu Berlayar – Pulau Lengkuas – Pulau Kelayang – Pantai Tanjung Tinggi Rise bright and early, for this island-hopping fun-ness will be one you don’t wanna miss! Be sure to bring swimsuit, change of clothes, sunblock, comfortable apparel and footwear for the journey. After breakfast, we’ll begin to explore the array of beautiful islands nearby, departing from blissful Tanjung Kelayang beach to the first stop, Pulau Gusong/ Pasir. This mini ‘island’ is made of pearly white sand sitting right in the middle of the sea, only accessible during low tide. Next, we head to the wondrous Pulau Batu Berlayar. Indulge in a jaw-dropping view of granite stone formation standing on a shallow shore, surrounded by crystal clear water and powder soft sand – definitely worthy of your Instagram collection ;). Now get ready to jump into the water and explore the vibrant coral and underwater life in Pulau Lengkuas with our snorkel gear! A quick lunch stops at the pristine Pulau Kepayang before we head back to visit the Tanjung Tinggi Beach. Famous for its exposure at “Laskar Pelangi*” movie, this beach boasts on its elaborate granite rock assembled so elaborately complementing the gorgeous beach view. Head back to the hotel to freshen up for dinner at local restaurant, followed by a night gift shopping at local outlets. Day 03 : Laskar Pelangi* & City Tour Laskar Pelangi* Elementary School – Literary Museum Andrea Hirata – Batik Gallery – Tarsius Conservatory Today’s tour will focus on the sceneries and locations where Laskar Pelangi* movie is set. Early morning checkout after breakfast, and we will take you to the elementary school where the film was set. Followed by a visit to Indonesia’s First Literary Museum - “Museum Kata Andrea Hirata” who is the author of Laskar Pelangi* novel. We will then take you around for fascinating insights of Belitung culture through the Batik Gallery and exotic aisle of traditional Belitung wedding. Last but not least, meet our little endangered buddy, the Tarsius (Pelilean) in conservatory. Often referred as the smallest primate in the world, they are established as the fauna that uniquely represents Bangka & Belitung Island identity. Our guide will then take you to the airport for your next flight destination. *Laskar Pelangi (The Rainbow Troops) is a famous Indonesian movie adapted from a novel by Andrea Hirata, a Belitung writer. It is based on the true story of the writer’s and his group of friend’s pursuit of their ‘impossible’ dreams in the face of poverty and hopelessness. With an inspiring message of hope and focus on the importance of education and friendship, this movie became a phenomenon nation-wide and widely accepted internationally. The movie introduced the captivating beauties of Belitung Island to the eyes of the world.